Aspect ratio can sometimes be a confusing concept. Panoramic prints, square photo prints and A sizes are all affected by aspect ratio and how your picture will be cropped. Virtually all print sizes are based on aspect ratio, consequently it can make life easier if you have a basic understanding of how it works.Working out the aspect ratio of your photography is actually a lot easier than it sounds. Simply put, aspect ratio is the relationship between the height of your photo to the width of your photo, generally expressed as two numbers with a colon in the middle. 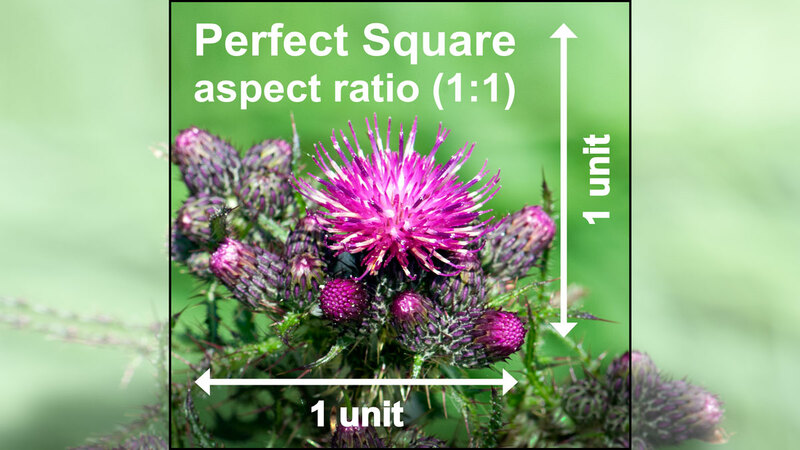 Aspect ratio = (Width : Height), we hope this short article helps . . . The most basic form of aspect ratio is a perfect square. The aspect ratio of a square would be expressed as (1:1), meaning that the height and width are exactly the same as each other. The ratio will remain fixed, regardless of the size of the square. Whether the square is 100mm x 100mm, 500mm x 500mm or 20 x 20 metres, the relationship between the height and width is always the same. Therefore, the figure of (1:1) will always remain the same so long as it is still a square. Whilst the height and width remain equal, with the same unit of measurement on each side, your square photo print will always be (1:1). This is where it starts to become more complicated. Aspect ratio becomes particularly relevant with panoramic images. A basic panorama might have an aspect ratio of (2:1), more of a rectangle than a square. This means that the width (length) of your photo is two times the height. The diagram shows how the ratio changes. Notice how the image still has one unit of height, however there are now two units in width. The print is able to encompass two butterflies perched on flowers side by side. 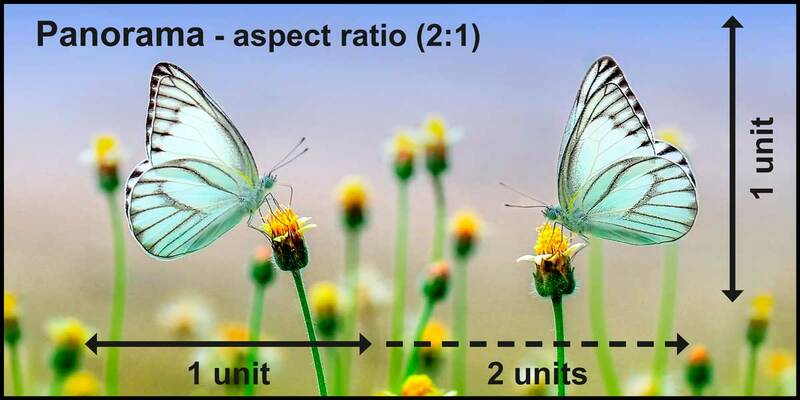 If the aspect ratio was still a square, only one butterfly would have fit. However, more of the width of the landscape has been included in the crop of the photo, as the aspect ratio is now (2:1), twice the amount of width as there is height. Looking at it mathematically, take the height and multiply it by 2, resulting in a panoramic print (2:1 aspect ratio). If you were to order a poster with a height of 200mm the width would be 400mm, or 500mm high would be 1000mm wide. The aspect ratio remains the same, even when the size changes. Starting to get the concept? Todays’ mobile technology, mobile phones, iPhones, tablets, iPads and specialist panoramic cameras are capable of creating a wide range of panoramas. These include panoramas where the size is set to a specific aspect ratio or devices where you can continuously scroll in a horizontal arc whilst a panorama is created by clever internal software. Gone is the need for specialist software on your computer to assemble a number of carefully captured photos to create your perfect panorama. Images can be taken whilst out on walks, climbing a mountain or simply lazing on the beach. In order to cater for these wonderful images, which can be crafted in an array of sizes, we have created a range of panoramic print sizes based on aspect ratio. Nestwe move on to Super Panorama (3:1 aspect ratio). This size range continues using the same calculations. The width (length) of the image is now three times that of the height. Notice on the example diagram, how we are beginning to see 3 units included within the width of the photo, whilst the height still remains as one unit. In this photo we have a beautiful expansive poppy field in sunset with a large expanse of cloud and sky above. The next stage is Ultra Panorama (4:1 aspect ratio)…we’re sure you have figured it out by now…the width is four times that of the height. In the example diagram we can now see the peak of the hill on the right. The image now encompasses less of the breadth of the poppy field, and a smaller amount of sky above the sun ... making a stunning vista and a beautiful poster for your wall. The softer coloured area displays the area that has been cropped when we have increased the aspect ratio from (3:1) to (4:1). Finally, we come to a slightly more complicated aspect ratio, X-treme Panorama (4.5:1 aspect ratio). For our widest panorama, we add an additional half to the aspect. It seems an odd thing to do, but this particular aspect gives you the ability to print those amazingly wide panoramas taken on holidays and walks using iPhones, android phones and cameras with a panoramic setting. The 4.5 figure before the colon means that the height is multiplied by 4 ½ times in order to determine the width. If you inspect the diagram, you can now see that the photo is quite dramatically cropped. However, taking a panorama with an iPhone or camera can often result in the final photo fitting perfectly into this size range with no cropping required. Never fear – In practice, it is not really necessary to know the aspect ratio of your panorama. Our website tool does it all for you. Simply upload your photo to the website on our panoramic photo prints page. When the thumbnail appears, select Panorama (2:1 aspect ratio). A preview will appear, showing you how much of your image will be printed on your poster. If too much of the photo is being cropped from the sides, then continue by simply selecting the different size ranges (aspect ratios) until you are happy with the revised preview. Next you can select one of the sizes available for your particular aspect ratio. And finally… just wait for your print to arrive. Your personal photography has become beautiful wall art! A4, A3, A2, A1 and A0 are actually extremely clever sizes. They have been thought out in a very unique way. Two A4s laid side by side will fit into an A3, two A3s laid side by side will make an A2 and so on … up to A0. This is actually a very clever concept, which has been created using a very magical aspect ratio (1.414:1). This has set an amazing international standard, which today we accept as perfectly normal, never questioning the unique way the sizes fit into each other. The advantage to photography is the ability to purchase an array of ready-made frames that your image can slot into. Fortunately, the photos taken on most of todays devices – cameras, phones or tablets can easily be cropped to fit, with very little lost from the original image. Simply upload your photo file to our website, print A0, A1, A2, A3, A4. Our cropping tool will show you a preview of your final print. 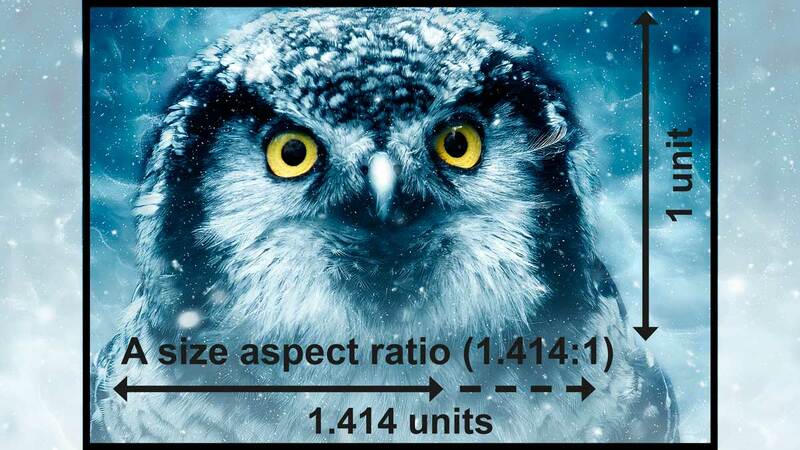 We hope our article has helped you to understand the makings of aspect ratio. However, not to worry – our web tools do all the work involved with aspect ratio for you. Your high quality print will arrive ready for you to enjoy.